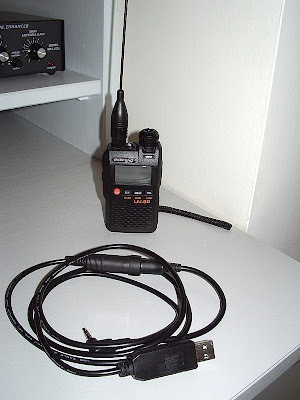 Today I made a programming cable for the Baofeng UV-3R. Until now I couldn't be bothered, as the radio is easy to program manually and neither the cost of sending off for a programming cable nor the complexity of building one of the programming interfaces published on the web seemed worthwhile. But it turned out to be very easy. A few months ago, with other purposes in mind, I ordered on eBay two USB/TTL/RS232 cables. If you search eBay for "PL2303" you should find a couple of sellers: one from Hong Kong is currently selling a single cable with free shipping for £3.99. These are USB plugs with the serial converter built in to the plug. At the other end there are four wires: GND, TXD, RXD and +5V. The logic level is 3.3V (at least mine are) so it can be used directly with the UV-3R. Just solder the appropriate wires to a 4-way 3.5mm jack plug. Cut off the red +5V wire and make sure it doesn't short out against anything. In the photo you'll see that there is something else in the middle of my cable. That's because I used a 4-way 3.5mm to mini-DIN adapter sold for use with various Yaesu radios such as the VX-1R, VX-3R, VX-5R, FT-60R and VX-150 instead of a simple plug. I bought that at the same time I bought the radio as I thought it might be useful if I wanted to try connecting other things such as a TNC. Plus the simple 4-way 3.5mm jack plugs are a bit hard to find. Mini-DIN plugs can be a bugger to solder, especially with my hands shaking as they do now. But the inline socket I used today had terminals that would hold the tinned end of a thin wire pushed into it even without soldering, which made the job easy for me. I tested the new cable with the UV-3R programming software and it worked, so that was a good result. By the way, I saw on the UV-3R Yahoo group that the free cross-platform cross-radio programming tool CHIRP will soon be supporting the UV-3R. I can claim a little bit of credit for that as I was instrumental in persuading a UV-3R user who had been investigating the programming protocol to share his findings with CHIRP's author. So soon you'll be able to upload memories from other radios into your UV-3R. I ordered mine uv3r once you have mentioned about it. I am using it almost everyday and I am very happy! I didn’t know the CHIRP project existed until you pointed me toward it. From Dan’s (KK7DS)comments, it looks like adding the UV-3R to CHIRP won’t be too hard. Have you tried making a USB or car charging cable yet? A Nokia charger with the polarity reversed (i.e. Nokia: inner +ve, outer -ve. Baofeng: inner -ve, outer +ve) should do the trick. I made a USB charger cable ages ago & have used it to charge from the PC as well as the numerous 5V wall warts with USB output I have got. You need one capable of at least 500mA output. Thanks for the heads up on CHIRP it covers a few bits of kit I have. No more having two programs open and cut/paste from one to the other. That said I don't exactly need it at the moment but nice to know it is available when I do. Is it should be 3.3V or 5V TTL UART cable? It would have to be 3.3V. The UV-3R is powered by a 3.7V battery so it can't do 5V logic levels. One UV3R received here today. No real need for a programming cable. All steps, repeater shifts available via the menu's. I agree, the UV-3R is easy to program manually. But as it cost next to nothing to make a cable I thought I'd give it a go.